AfriHost Review 2019: Is AfriHost a Good Hosting? Afrihost first started off as a small venture formed by three friends, and soon turned into a very well-rounded web hosting company with outstanding customer satisfaction rates. With a lot of pros to offer, Afrihost is one of the best companies in the South African web hosting market right now. They’ve won several awards over the years, including South Africa’s Best Customer Service Award from PriceCheck in 2017. What first began as a small startup by three high school friends soon turned into an award-winning web hosting, broadband, and telecommunications provider. It first appeared in 2003 and has since served over 250,000 satisfied customers. They’ve won several awards over the years, including South Africa’s Best Customer Service Award from PriceCheck in 2017. Their data center is located in Johannesburg, South Africa. You can choose either Linux or Windows as your operating system. The Linux plans do offer more features and resources than the Windows ones, with the exception of Microsoft-specific features such as Silverlight and Microsoft SQL databases. Also, all Linux Pro plans offer access to a website builder, whereas the Windows Pro plans do not. This was a fairly standard entry-level package that affords you everything you need to establish a basic online presence, including a free .co.za domain registration. Note, however, that Afrihost doesn’t offer any SSL certificates as part of their packages, so if you need a secure website it’ll cost you extra. All in all, Afrihost’s packages are more than adequate to set up a fast-loading, dynamic website. However, you can only host a single domain with any shared hosting account. If you plan on setting up multiple websites, you’ll have to opt for their cloud hosting packages or better. Afrihost also offers cPanel 11 with every shared hosting package. This is an all-inclusive web-based control panel that affords you full control over your domain (email, files, backup, FTP, CGI scripts, web site statistics, and more) through a web interface. To manage your account, they’ve created their very own ClientZone management portal, a user-friendly and aesthetically-pleasing interface that allows you to get information and adjust whatever you need to within your account. Afrihost also has an extraordinary 100% uptime guarantee. Of course, this doesn’t apply to regularly scheduled maintenance periods, suspension of service due to any violations of the terms of usage, or any problems with the client’s ISP link to the host server. Overall, Afrihost’s packages are competitively priced for the South African market. Unsurprisingly however, their Windows shared hosting packages cost slightly more than their Linux ones. Best of all, Afrihost allows you to instantly upgrade or downgrade your package at any time if your needs suddenly change. One of the aspects I love most about Afrihost is their double money back guarantee. It’s not about the money as much as it is about the trust they’re establishing with their customer base. While most web hosting providers would offer a one-month money back guarantee, Afrihost really goes out of their way to let you know that they’re confident in what they sell. You have 60 days to test out their services and if you’re not completely satisfied, they will not only return what you paid, but double the amount. That’s some real confidence over there! Afrihost also doesn’t require a minimum contract period. If at any time and for any reason you decide to switch to another web hosting provider, Afrihost makes sure the process is as smooth and easy as possible. All you have to do is cancel before the 23rd of the month. Customer support is probably the strongest side of Afrihost; their vision was to create a company driven by client and employee satisfaction, after all. You can reach them via their support ticket system, email, or telephone — though the latter is only available during South African business hours. They also have live chat, and — intriguingly — a WhatsApp support line. Alternatively, you can peruse their extensive knowledge base with over 220 articles and video tutorials. With reliable infrastructure and excellent security, Afrihost is on the top of my list when it comes to South African web hosting. However, they may not be the best choice for e-commerce websites or large WordPress installations, given their lack of included SSL certification or specialized WordPress support. 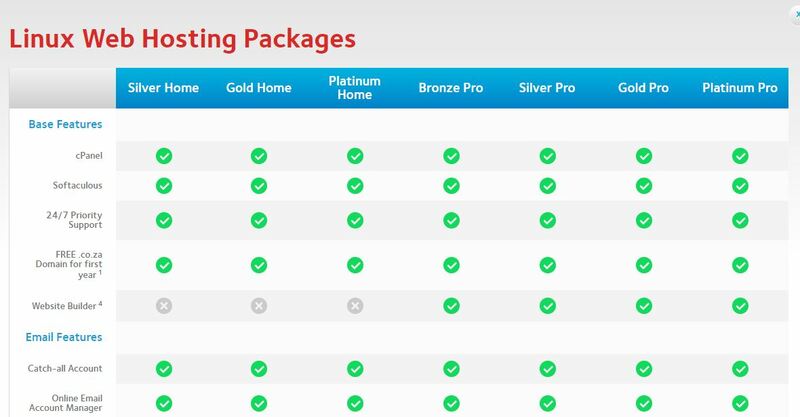 Wondering how AfriHost stacks up against other Web Hosting companies? Enter any other Web Hosting company and we will give you a side-by-side comparison.